Historically, students with the most significant cognitive disabilities were often taught only functional skills in our K-12 schools - how to do self-care, tell time, use money, carry out routine daily tasks. But several laws, including the Individuals with Disabilities Education Act (IDEA 2004) and the Every Student Succeeds Act of 2015 (ESSA), have affirmed that students with disabilities have the right to access the grade-level curriculum. Today, we know how much more students can learn when provided with the opportunity, and growing numbers of families, educators, and students are advocating for higher expectations and a more inclusive educational experience. Learn about the members of the Autism Caucus, which was founded by Representatives Mike Doyle (PA) and Chris Smith (NJ) who also Co-Chair the Coalition for Autism Research and Education ("CARE" or "Autism Caucus"), the first-ever Congressional Membership Organization dedicated to autism advocacy on Capitol Hill. On September 7, the Senate Appropriations Committee completed its mark-up of the FY 2018 Labor-HHS-Education appropriations bill and voted to report out the bill by a vote of 31-1 with Sen. James Lankford (R-Okla) casting the sole "nay" vote. The House Appropriations Committee completed its work on July 19 (see links to bill and summary). 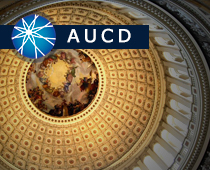 Attached is a summary of how the bill impacts the AUCD network and other priorities of the disability community, along with a detailed table comparing the House and Senate bills with the President�s budget and FY 2017. This guide describes the processes involved in legislation and provides suggestions for maximizing the effectiveness of your interactions with policymakers. Joint priorities of AUCD, NACDD and NDRN during the 11th Congress, as we work with the Administration, states, and local governments to achieve better outcomes for all people with disabilities. Mark your calendar for upcoming DPS events and review documents and photos from past DPS events. A comprehensive guide to providing Senate offices and constituents with valuable information on accessibility throughout the US Capitol Complex, developed by the offices of Senator Mike Enzi (WY). This manual (PDF) includes a variety of ideas and suggestions to help address the needs of staff, constituents, and visitors with accessibility needs, including: basic rules of etiquette; locations of accessible routes and entrances; accessible room design; and emergency evacuation procedures.